Krzysztof Komeda (born Krzysztof Trzciński 27 April 1931 in Poznań – 23 April 1969 in Warsaw) was a Polish film music composer and jazz pianist. Perhaps best known for his work in film scores, Komeda wrote the scores for Roman Polanski’s films Rosemary’s Baby, The Fearless Vampire Killers, Knife in the Water and Cul-de-sac. 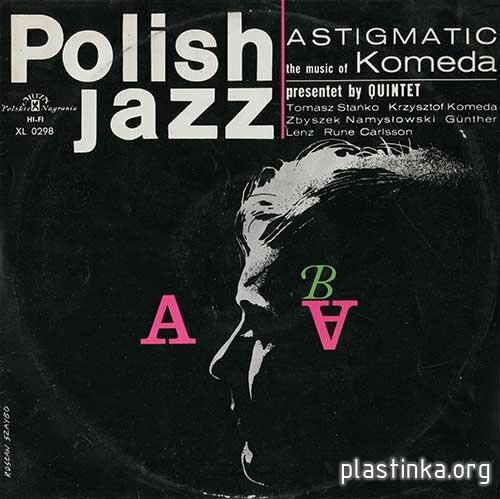 Komeda's album Astigmatic (1965) is widely regarded as one of the most important European jazz albums; critic Stuart Nicholson describes the album as "marking a shift away from the dominant American approach with the emergence of a specific European aesthetic." Jazz musician and film composer Krzysztof Komeda is best known for his film scores for the movies of Roman Polanski and Ingmar Bergman. Born Krzysztof Trzcinski in 1931, he used "Komeda" as his last name because of Communism disfavor with jazz music. Professionally an ear, nose, and throat specialist, Komeda composed and played jazz piano, and was well received at the 1956 Sopot Jazz Festival. Komeda's chief musical accomplishments were in free jazz. Komeda performed and recorded with trumpeter Tomasz Stanko (from 1963 on) and Swedish tenor saxophonist Bernt Rosengren. His album Astigmatic (1965) is acknowledged as his masterpiece. His best-known work, however, was in the realm of film scores, which he focused on increasingly in the last years before his death. He scored over 40 films for directors including Polanski, Bergman, Andrzej Wajda, Henning Carlsen, and more. After composing the score for Polanski's famed American movie debut, Rosemary's Baby, Komeda was severely injured in a car wreck in Los Angeles. After emerging from a coma, Komeda returned to his wife, Zofia, in Warsaw, and died in 1969, not yet 40 years old. In 1998, the Power Brothers label reissued the much-hailed Memory of Bach, 1967's Nighttime, Daytime Requiem, and Mojo Ballada, which includes a different recording of the music for Polanski's Knife in the Water and pieces for Miroslaw Kijowicz's cartoons. Innovator with a complex of tradition, romanticist expressing himself in the contemporary idiom, poet of piano — this is KRZYSZTOF KOMEDA, one of those musicians who have widened the essence of jazz. He has proved that the world of emotions hitherto remaining within the scope of symphony music could manifest itself in jazz as well. He did it by introducing into it dramatic lyricism and pathos which in their extatic, even mystic intensity are in the late-romantic, Promethean, Skriabin-like modes of expression. Svante Forster, Swedish poet and writer, friend of the composer). The solo parts have ceased in it to be blowing choruses and have taken on instead a definite function, while the simple construction of the piece, concentration on a single idea (one movement, one theme), as well as much scope for improvisation and the psychic contact between the players contribute to the fullest realization of the composition. The dramatic and constructional elements are not the only characteristics of Komeda’s style. The particular „Slavonic” feeling of his pieces results from the fusion of all sorts of stuff: beside contemporary technique of composition (sound spots, clusters, aleatoric and poliagogic structures) there are structures getting out of fashion (modalism or the extinct harmonics of the last century) or the ’’fossilised”, long forgotten forms of the musical prematter (as for instance the simple drum beating — the obsessive rhythm, how very fresh and revealing nowadays!, or the uncontrolled instrumental ”cry”). Komeda’s pieces are outlines to be performed by a group of chosen instrumentalists. No wonder that Komeda selects his partners carefully. Then there is in Komeda’s group TOMASZ STAftKO, a leading Polish trumpeter, a striking individuality. Since recently he has been playing on the fliigelhorn, extracting from it a fine, voluminous sound. As guest performers appear with Komeda: GUNTER LENZ, playing double-bass with the West-German Albert Mangelsdorff ensemble, a musician of rich technique and imagination; and ZBIGNIEW NAMYSLOWSKI from Warsaw, one of the leading altsaxophonists of the younger generation (b. in 1939), known in numerous countries in Europe and in USA. KRZYSZTOF KOMEDA himself (born on April 27, 1931) is a pianist, a musician whose career has been very rich. He has been playing as jazz musician since 1959, appearing in many European countries and having a particularly great success in Scandinavia. He has written music to over thirty films both Polish and foreign. Among others to ”Two Men with a Wardrobe”, ’’Mammalia”, ’’Knife in Water”, ’’Cul-de-sac”, all by Polanski, to ’’Innocent Sorcerers” by Wajda, ”Hvad Medos” and „Kattorna” (Cats) by Henig Carlssen. Just from the latter comes the second of the pieces recorded on this disc.